Being an endurance athlete is tough business. It requires an individual to work hard and, just as important, rest hard. We all know that feeling when we feel totally depleted and exhausted of energy and strength due to a long or even a short tough workout. It hurts so good! In the end, muscles need to be worked hard, broken and worked hard again. Here’s a handful of easy and very effective ways to speed up your recovery. Bottom line; recovery helps you get back into action. 1. Take an Active Rest Day: I’ve lived my whole athletic career living by the saying, “Train into shape, rest into fitness.” To me this means it’s best to spend several weeks building up to tougher and tougher workouts, then rest the muscles so that they can become stronger. Go out for a good workout, then come home crawling with exhaustion. Greg LeMond once said that he would never take a rest day. On his rest days he would roll around the neighborhood cruising in only easy gears. He wouldn’t go hard or strain his muscles. He simply didn’t like that stale feeling after doing nothing for a day. Go for a rest day, but do something to move the blood around. Give your muscles time to mend, but keep your muscles feeling fresh by doing something active. 2. Get a Massage: Massaging muscles helps move blood through, unties “knots” that have built up with your connective tissues and reduces swelling. Take it easy, your muscles may feel tender. 3. 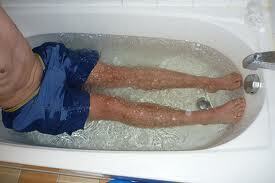 Take an Ice Bath: It’s an intimidating thought for some (especially me!) however ice baths are also very effective in reducing core body temperatures and can effectively reduce soreness and inflammation. Fill the bath tub with cold water and throw in a bunch of ice. Afterwards your muscles will feel fresh, relaxed and cool. You may also experience more comfortable sleeping. 4. Eat Something: After your workout your muscles are eager to start the recovery process, therefore absorption happens quicker. Focus on protein for your immediate recovery nutrition. The recommended time after a workout is within 30 minutes. This is especially important for events that last for multiple days (e.g. stage races). 5. Use Compression Garments: For most of us we’d like to recover from a tough workout then, the next day, get back to another tough workout. Research has shown that compression garments can help decrease recovery time. 6. Use Consistent and Proper Nutrition:Proper nutrition is not easy in our way of life. We all have to work at it and be consistent. We always recommend using real food as your foundation of nutrition. Using supplements, like a multivitamin, will help ensure that you aren't deficient in any essential nutrient. Take an endurance sports supplement, like Endurance360 to help enhance your recovery and protect you against muscle cramps. Use Endurance360 Electrolyte Drops throughout the day and during exercise to ensure you have adequate minerals, including trace minerals, in your system. Sleep, recovery, and performance: the new frontier in high-performance athletics. Samuels, C. Centre for Sleep and Human Performance. Neurologic Clinics. 2008 Feb;26(1):169-80; ix-x.